I went to the lumberyard today to check out the wood for my bench. For those who didn’t read my previous post(s), this is lumber that has been rejected by the timber export company for reasons unknown. Well today I learned that part of the reason the lumber is rejected is because it needs to be straight, knot-free, etc. the entire length of the board. When it’s not, the whole board is rejected (even though some of it might still be beautiful wood!). The manager of the yard had apparently been looking here and there for the boards I needed (I told him the dimensions of everything, but said that I would be happy to cut it to length myself). Some of it has been cut to approximate length (with a little extra), while others are still long, ready to be cut into two or three boards. All the boards were well-marked, and the guy told me it’s all been kiln-dried. So I suppose that means it’s all ready to go once I get it home, huh? I was worried that the wood would be garbage. I knew that if it was, I would probably still accept it because to not do so would be quite rude to my church friend (who arranged for it all to be given to me for free) and to the manager who went through the trouble to get it for me. As it turned out, though, the wood in general looks quite nice, as far as I was able to tell. I could see a little cracking here and there, and a rough spot or two on some of the boards. But overall, the boards appear to be in good shape and I think will work well for my bench. The manager even gave me several extra boards of various lengths, so even if some of the boards are unusable, I may be okay with the extras. Worst case scenario I have to go to a different lumberyard to buy a board or two as replacements. Next step: Early next week the manager and I will take the lumber to a different place for planing (apparently he doesn’t prep the wood at all – merely sells it). What do you think – I’d only need to have the faces planed, right? Or should I get it S4S? I’ll have to pay for the planing, but what a small price to pay. Click on the pic for a larger view; that’s my soon-to-be benchtop there in the foreground! Sorry – I can’t tell the scale from the photos: are those 2″ x 4″s? Or hefty slabs? Planing: Sorry, what’s S4S? (I suppose I could Google it…) For me, it would depend on the price difference. And really (echoing a recent discussion on the OldTools list), only certain “reference sides” need to be planed. For example, if you’re using 4″ x 4″ beams as the legs, then only the inside two faces would need to be flat and 90 degrees; the outside edges can be all rough (if you’re being purely functional). All the boards are either 1x4s (top and stretchers) or 1x6s (legs). Will have them planed to 3/4″ or so. And S4S is “surfaced four sides”. I think S2S means planing just the faces, which like you say is the most important thing. I’d want the edges (of the legs, for example) to be smooth – for the kids’ sake if for no other reason, so they don’t get splinters – but the edges don’t have to be perfect and flat except for the benchtop. Most lumberyards only do “skip planing” where they run the boards through the planer and no jointing is done. Keep this in mind as there will probably still be a lot of flattening work you will have to do by hand. The more the yard takes off the less you will have to work with once you get it home and need to flatten it. I can’t say that I would get it planed for fear it might make more work later on. If you do, I wouldn’t go S4S cause it just won’t be flat unless they are jointing it which as I said is rare. Thanks, Shannon, for the info about how lumberyards work. I think I was (still am) hoping that once they run these things through the planer, I wouldn’t have to do much more than a couple minutes of sanding to get the boards ready for glueup. Perhaps I’m quite naive! I can’t quite see how the boards would need a ton of work after having been planed (twice, essentially, as they were apparently already planed to 1″ thick). Why would they not be flat? Help me understand! I’ve never used a thickness planer before so I have ZERO experience with what the wood looks like coming out of one. It sounds like you’re saying that once they run it through, the condition of the faces will be pretty much identical to what it is now – only the board will be less thick. If that’s the case, I think I still may have them shave at least a little off all the boards because having them exactly the same thickness is important for my joinery – the legs will be through-tenoned into the top, and if the thickness of the laminated legs is different than the thickness of the laminated top, the boards won’t line up right and that’ll mean more work for me later. Great score on the wood! What is it? Maybe it is time to sink the money you originally planned to spend on the wood into a thickness planer or a scrub plane. With the addition of a scrub plane you have all the tools you need to flatten and surface those (scrub, jack, smoother and a marking gauge). It sounds daunting at first, but if you are serious about being unplugged, it is a good make or break sort of moment. Get your Great Grandfather’s jack plane in shape and you’ll be way more successful than using sanding. Faster, truer, no dust, less noise…. When you say 1×4 and 1×6, are they a true 1 inch (4 quarters) thick? Thickness planing will cost an eight of an inch per face. Will 3/4 inch stock be OK? How much lamination will you be doing? I assume legs will be laminated. How about the top? Surfaced boards will ease the lamination process, making better joins. So, I would have those boards planed. Are there areas that won’t be laminated where it’s OK for surfaces to be rough, like the underside of the top? Maybe you won’t want those boards planed, just to keep the extra thickness. Then, after assembly you can hand plane the “show” surface. … and as “swirt” said, if you can plane a surface, it’s a lot easier than sanding and often smoother. In any case, you have a generous gift. Enjoy! As you run a board through a thickness planer the feed rollers press down on the board essentially flattening out any twist or bow while the blades but. Then when the board comes out the other side the twist and/or bow pops back to where it was before. If you plane both sides you should end up with parallel surfaces and it should at least take the cup across the width out but you will still have the twist and/or bow along the length. In my experience when building the laminated top, you want to keep these boards as thick as possible so you have less laminations to get to your finished top width. Regarding your joinery, I can see what you are saying but I found that actually cutting the tenons rather than building them into the laminations is less work ironically. Getting the boards to line up just right and not shift out of square while gluing is tough but sawing the tenons is much easier. 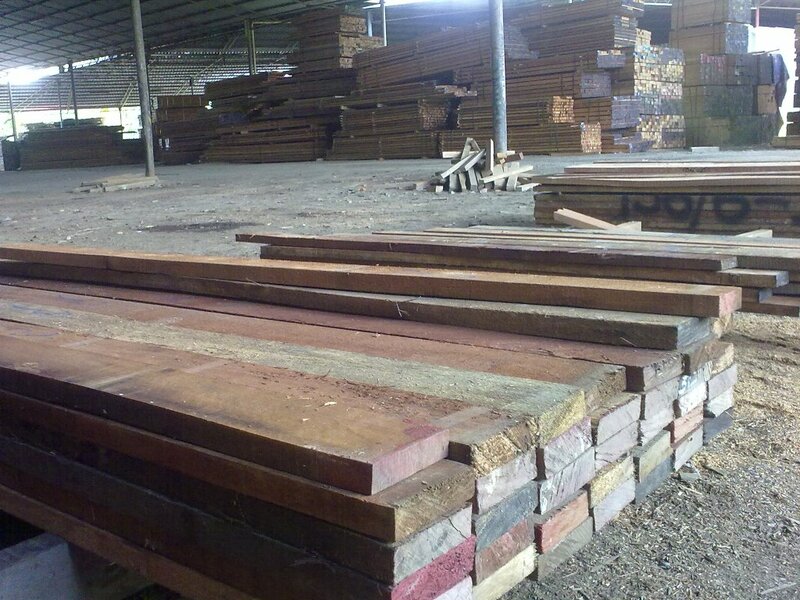 @swirt: This wood is called seraya, which is a type of meranti I’m pretty sure. Thanks for the encouragement to bite the bullet and really commit to surfacing boards with a hand plane (or planes). I needed that! @Bob: The boards are currently right around 1″ thick. So yeah, I’m thinking (almost planning on) that they’ll be about 3/4″ thick when the planer’s done with them. So the bench top will be 32 boards laminated together (although the guy actually gave me 35 boards). That would make the top about 24″ wide. And yeah, I’m thinking that I’ll tell them not to bother with the edges.